The problem is how to begin, how to narrate the beginning, and where to situate that beginning. Maybe it’s complicated because beginnings are always selfish. At the end of it all, all histories are subtly intertwined. The problem is where to start. If the details of the shadows of a history are broadened, the events, the characters, and the situations also vary. Thinking about where a story begins inevitably changes who is part of that story, how the story is accounted, and who counts in that story. With these variations (let’s not forget that this has to do with variations), the characters and pieces that form part of these stories will lay the foundations for how certain elements compensate for others, how they influence each other, how relationships of power are established, who has the authority to let others pass and who and what can cross. For example, materials in various amounts can pass. Mathematical knowledge can pass. But the people who produce these things may not. For this reason, this work is formulated as a gesture. The gesture of a request for hospitality. The offer of hospitality is implicit in the prerequisite of this gesture. The gesture has to do with thinking about other beginnings. What we are referring to here are the very subtle shadows that some societies mould in others. The shadows in question are ones whose edges are very difficult to define. They have become part of the fabric of the society in which they were moulded, and are almost indistinguishable from the rest of that fabric. We cannot anticipate the final forms that we will encounter when we expand the diffuse borders of those shadows if we have only been exposed to the history that has been given to us. These shadows are full of signs that do not differentiate between past and future. One of these many shadows is that of computation, a form of narrative that goes beyond speech. A communication made of rhythms. Computation is the accelerated expression of a reality annotated with algorithms, the totality of the world translated into numerical parameters. Human and non-human nature translated into numbers, and their possible mutual relations understood as capital to be exploited. Computation, as it is usually narrated, unfolds in modernity across Europe: in Germany, France, or England. One of its pioneers appears in all its stories: Charles Babbage, who designed the first mechanical computer, the analytical machine. 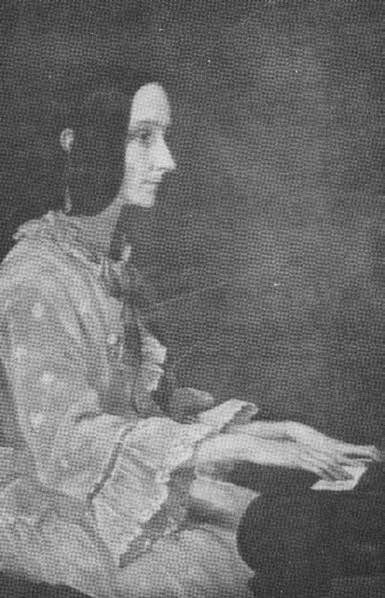 Not every history tells that the algorithms of this predecessor of the modern computer were developed together with a woman, Ada Lovelace. 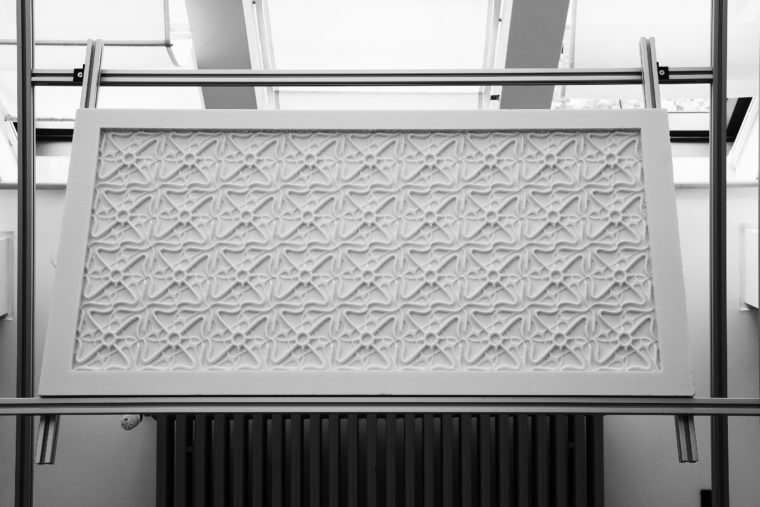 The system for the analytical machine was partially inspired by the Jacquard loom, which used perforated cards to make the designs of the fabric and to automate the production. Computation, in its beginnings, was linked to industrial weaving. The knots of these weaves have a degree of kinship with computation. Maybe there were other possibilities for the development of computation. The limits of its domains are difficult to define. Are mathematics inscribed in nature itself or are they the fruits of thought? Is the repetition of a series of rhythms in nature also a calculation pattern? Where does computing start? This architecture is a wind catcher. 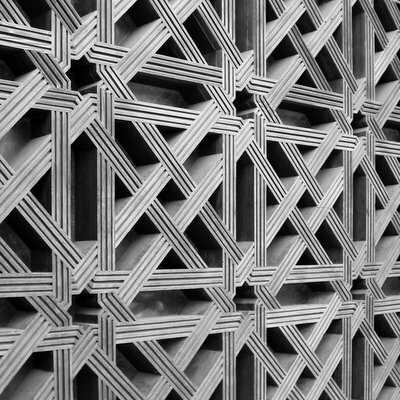 It is an architectural device of Iranian heritage, which was used for many centuries to provide natural ventilation and cool the buildings interiors. This Persian technology provided the means to cool an environment. These towers had the same function, then, as the heat sinks that electronic equipments have today. The heat sinks cool the atmosphere inside of a computer. The cooling of the structure is a fundamental part of the algorithmic operations of capital within computational systems. One of the possible beginnings is inscribed in the idea of the algorithm. The origin of the term algorithm can be found in the name of the mathematician Al-Khwarizmi, who was born in the ninth century in one of the regions of what is now known as Uzbekistan, in Central Asia. He spent much of his career in Baghdad, where he was part of the House of Wisdom, a center for research and translation where they preserved and translated a large number of Greek and Hindu scientific and philosophical works. There was a large number of scholars in this center who not only translated [existing works], but also achieved numerous advances in physics, astrology, mathematics, music, architecture and medicine. For example, the Banu Musa brothers developed a series of automatons and musical instruments that played themselves, and Al-Haytham, later known in the West as Alacena, made great advances in the science of optics and created the camera obscura, among many other inventions. Returning to Al-Khwarizmi, it was he who introduced the concept of zero through the adaptation of mathematics from India. He is considered not only to be the father of algebra but also the person responsible for introducing our numerical system. The innovation that algebra introduced was to use not only numbers, but symbols, as well, to represent undefined parameters, called unknowns. These formulas expressed rules or general principles. Algebra means reintegration in Arabic. In Al-Khwarizmi’s own words, algebra served for that which is easy and most useful in arithmetic, such that men constantly require it in cases of inheritance, legacies, partitions, judgments, commerce, and in all their dealings with others, or when it comes to measuring land, excavating channels, geometric calculations, and other objects of various kinds and types. The word algorithm is derived from algebra. Algorithms are the mechanization of methodical procedures that constitute a large part of computing. Algorithm refers to a finite group of operations organized in a logical and orderly way that allows one to solve a certain problem. Algorithms allow a transition between numeric values ​​and language. They are a system of notation. The notation is the graphic indication of a need in the integration in social relations. It regards a series of instructions or established rules that, through a succession of steps, allow one to arrive at a result or solution. Without this basis, much of Western mathematical knowledge would not have developed. The traces of this translation are present in scientific processes as well as in European art and architecture, and even in the invention of photography. This is a story that remains hidden within the genealogies of computing. To understand transcultural forms of knowledge, one must rethink one’s genealogy. Computing was developed in part thanks to ideas from Syria. Ideas can cross. The people, maybe not. This is a pattern called Girih, which means knot in Persian. It is present in much of Islamic architecture and art. Centuries before computerized geometry, through its knowledge of abstract mathematical symbols and their unifying relationship, Islam had the objective of relating the material world with its basic abstract principles. 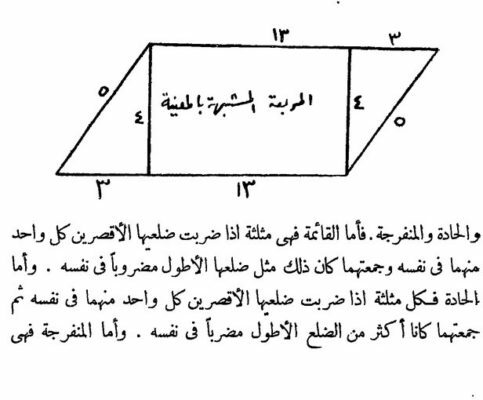 While the means of conceiving the perspective space in the West focused on the position of an individual, in the Arab development of perspective the individual’s position did not matter. In principle, through Sufi ideas, all perspectives would be valid. What would a computer system that did not separate subject and object be, one that did not allow for the exploitation of the other? Such a conception would result from a structure of cultural interdependence: by definition, cultures that intertwine and naturize as a hybrid. These are some of the ceramics that are in LABoral. The architect Luis Moya commissioned them from the workshop of Ruiz de Luna in Talavera. These ceramics collect the aesthetic influence and mathematical knowledge of the Islamic history of the peninsula. In that city, the ceramic tradition integrated, along with other traditions, the legacy of Islam. We tend to forget the fact that our system is just one of many possibilities, and that its development began with major contributions originating from Babylonians, Hindus, and Arabs. If history is not a collection of given facts, but as a reality that is perpetually co-produced by historians, the future will be automatically the perpetuation of contemporary conditions and relations, but rather be a time of various dimensions in which past and future are interwoven. History is not a collection of given facts, but as a reality that is perpetually co-produced by historians, the future will not be automatically the perpetuation of contemporary conditions and relations, but rather a time of various dimensions in which past and future are interwoven. This object is a yupana. It is a device from the Inca tradition, which was used to perform mathematical calculations. This technology was used to solve problems in accounting. The calculations were made through the movements of small beads —stones or seeds—from one section to another. Those below were units, then came the tens, hundreds, thousands and finally, the tens of thousands. It was a problem of position resolved through the physical movement of its components. It was the equivalent of the electronic impulses that occur within a computer. One of the possible beginnings of computation could be thus inscribed in Inca mathematics. The Inca possessed a numerical system based on the decimal system, which included the concepts of zero and of emptiness. That writing system of the signs was the quipu. Thus, these knots, like those of a woven fabric, communicated an idea of ​​the world. The quipus were a non-phonetic writing system. 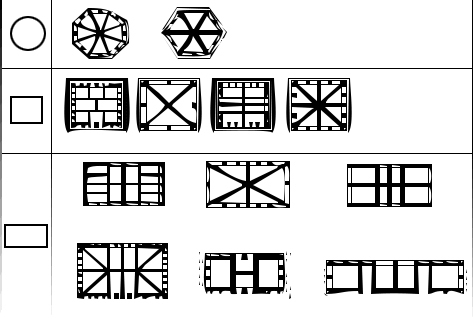 They were a three-dimensional writing system, a tactile and palpable system of computation. Inca computing required the body. Their system of mathematics did not favor sight over other senses. Touch and hearing were also fundamental. The knots presented a series of information that needed to be completed with speech and mnemonic exercises. Some peasants in Peru still use quipus to inventory their livestock. By means of the number and arrangement of the knots and the color, thickness and length of the cords, the quipus constituted a set of signs with which numerical calculations could be made, and which could document important events. The quipus are not just statistical records. They are also a form of narrative record through which some of the society’s social relations were articulated. Writing, like computing, is a structure of symbols that is defined through its interconnections. Quipus allowed for a transition between numerical values ​​and language. They are a system of notation. Notation is the graphic indication of an exactitude in the integration in social relations. It refers to a series of established information that, through a succession of steps, allows one to arrive at a result or solution. Beyond the numerical values, it is not known exactly what the narrative meaning of the quipus may be, since it was a system of notation without written words. These lost codes are containers into which new meanings can be poured by means other than the original code. This is a story that remains hidden within the genealogies of computing. In order to understand transcultural forms of knowledge, it is necessary to rethink its genealogy. Maybe the quipus will never be deciphered. But that makes them a projecting-translation-machine that connects the future and the past. 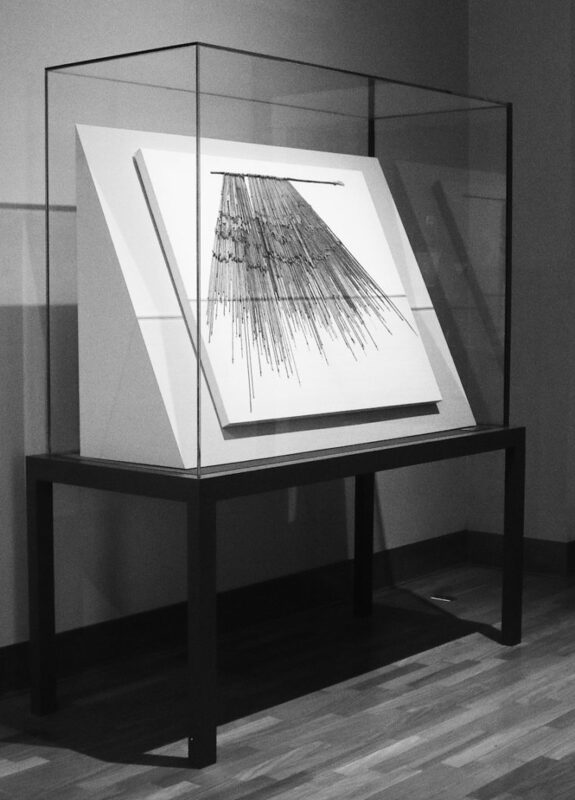 This is the series of strings that form a quipu. Quipu means knot in Quechua. Quipus are not a form of phonetic writing that can be read in the Western sense: as if each element of its construction (knots, colors, threads) were a sound. 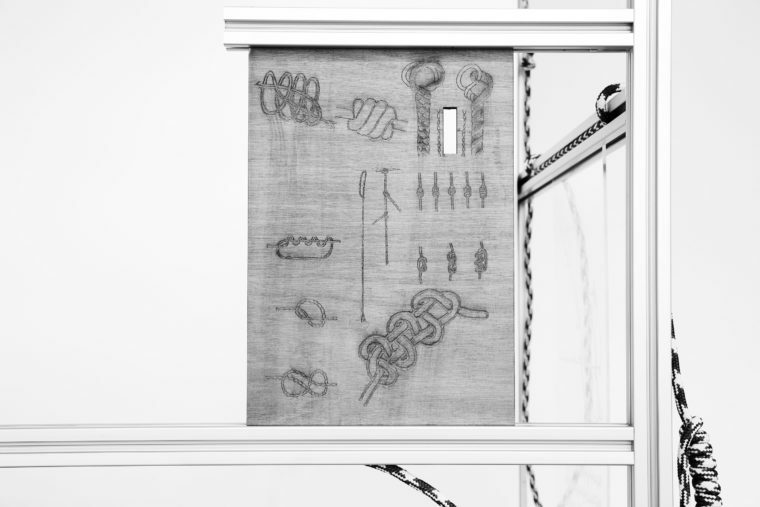 The quipu can be considered a writing system in the broad sense of the word: a set of visual and tactile signals that are organized to contain meaning. The quipus are a system of three-dimensional notation. Unlike writing, which requires instruments to be performed, the quipu’s tactile information is transmitted through twisting: creating combinations of colors through its knotted strings. Most likely, the quipus registered syllabic elements, names, and narrative and non-numerical information. 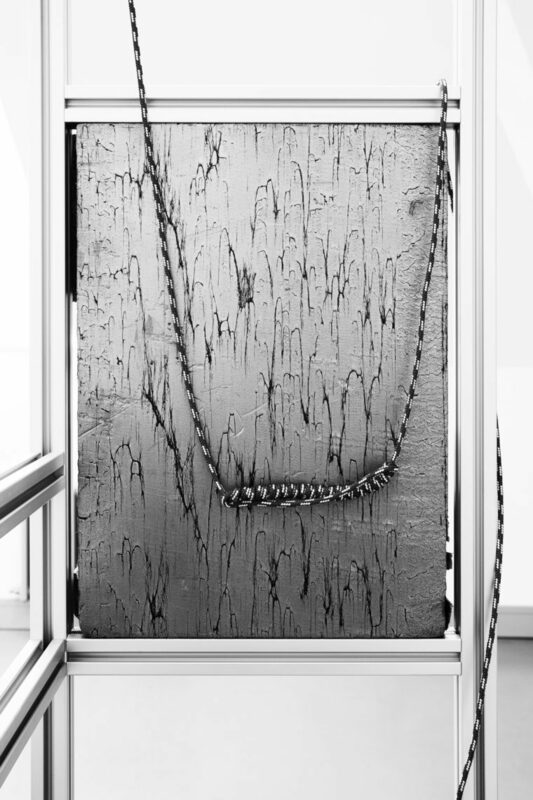 This is an imitation of a quipu, with an invented numerical value, representing a speculative and formal development of its mathematics. Without the social, economic and cultural impositions of the Spanish empire in America, perhaps another type of knowledge could have been developed. Perhaps these strings would have developed another type of computation not based on the exploitation of capital. The accounting system of the quipus functioned as a form of inventory of property, and of collective obligations, activating forms of distribution and redistribution. What would a computer based on these principles look like? *This montage text is a written mirror of the video-work Shadow Writing (Algoritmo/Quipu)composed by free adapted quotes from Marcia Ascher & Robert Ascher, Hans Belting, Nader El-Bizri, Sabine Foster, Ramón Guardans, Elizabeth Hill Boone, David Link, Walter D. Mignolo, Ruba “Mohammed Ali” Salah, George Saliba, Frank Solomon, Gary Urton, Siegfried Zielinski & Franziska Latell. ** The project “Shadow Writing (Algorithm/Quipu)” was produced at LABoral Centro de Creación Industrial with the support of DKV Álvarez Margaride production grant. 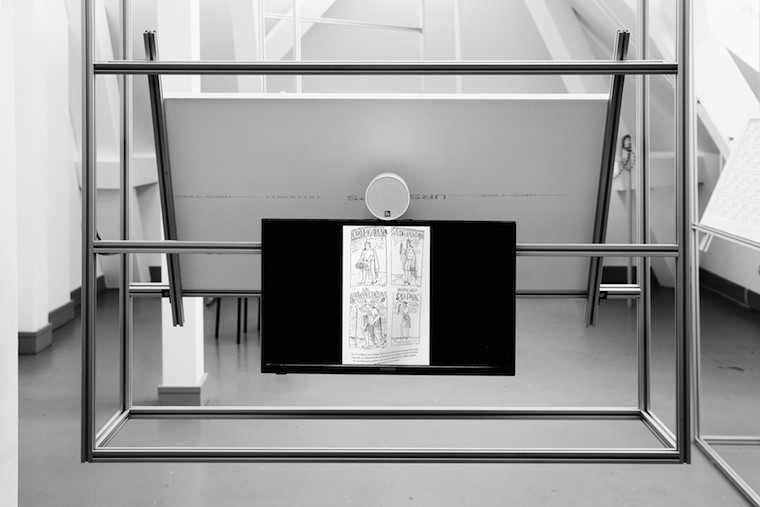 The images of the pieces part of this text were taken in its second iteration at Schwartzsche Vila, accompanied with a book published by Archive Books. 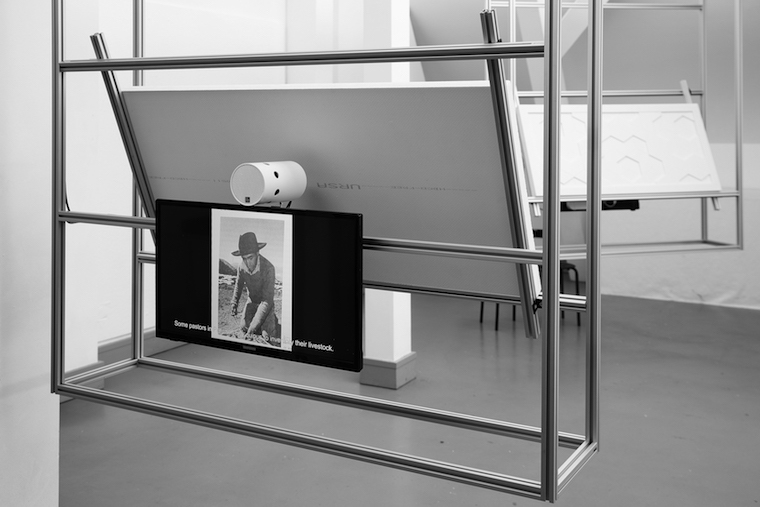 Lorenzo Sandoval is as an artist and curator with base in Berlin. 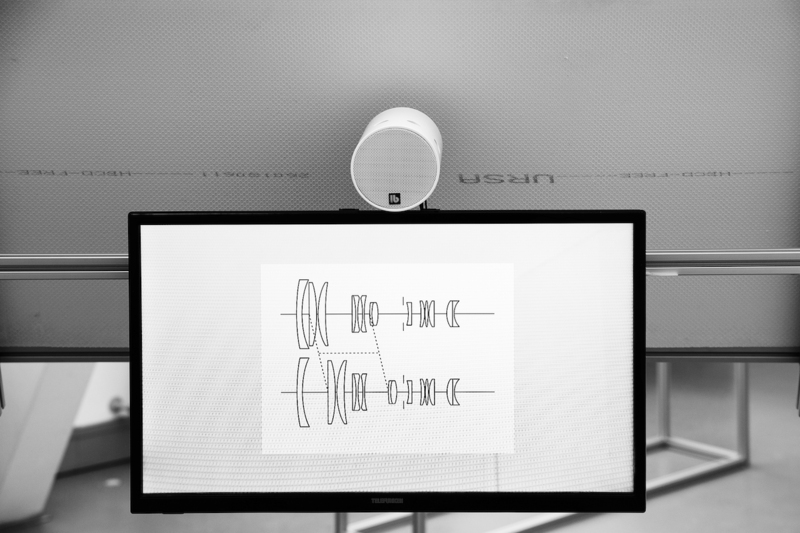 He produces spatial devices that allow different configurations. 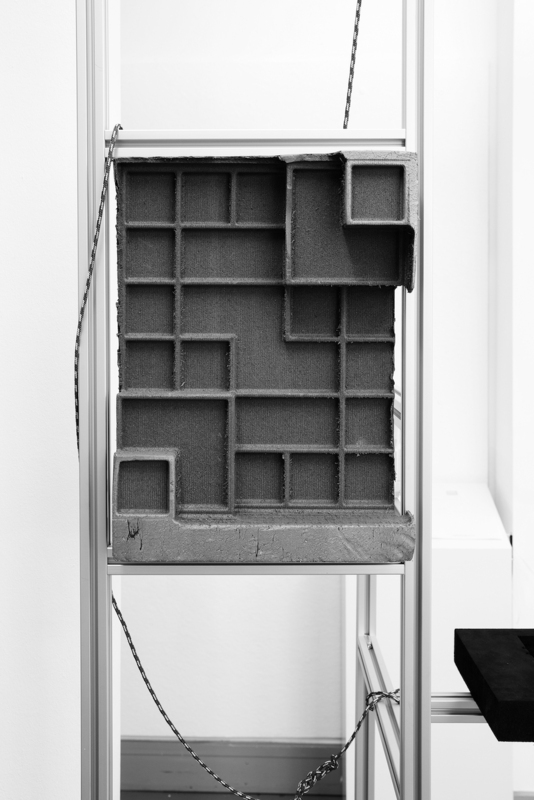 He works on divergent genealogies of the relationships between textile production, image distribution and computing. He has directed since 2015 The Institute for Endotic Research, a task he shares with Ben Busch since 2018. 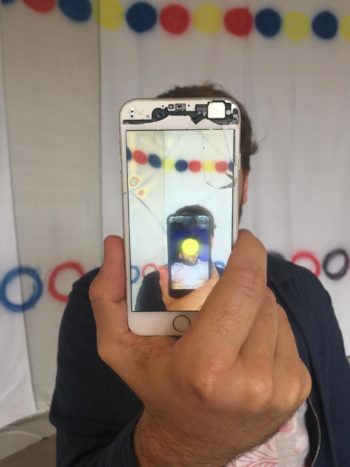 He is part of the Miracle Workers Collective for the Finnish Pavilion of the 57th Venice Biennale, 2019.